There is a bunch of cool stuff coming out of Microsoft right now. 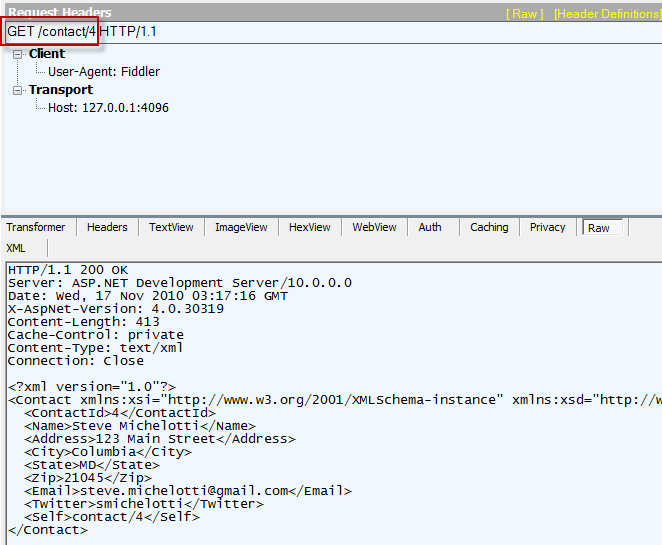 As I've previously blogged, WCF Web APIs is one of them. One of the cool things that was shown by Glenn Block at PDC a couple of weeks ago was Media Type Processors. 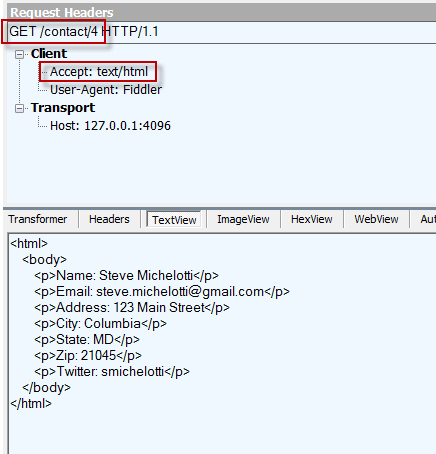 Media Type Processors provide a way to allow the consumer of your service to be able to specify the format they want on their response simply by setting the Accept header on the request (and thereby allowing your service to conform to HTTP standards). 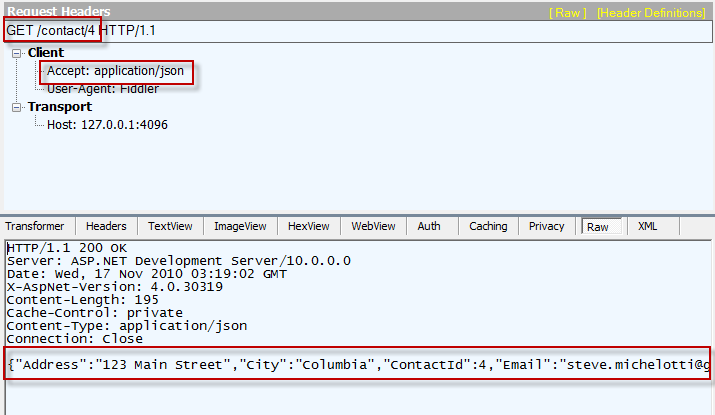 Out of the box, WCF will support xml, json, and OData. 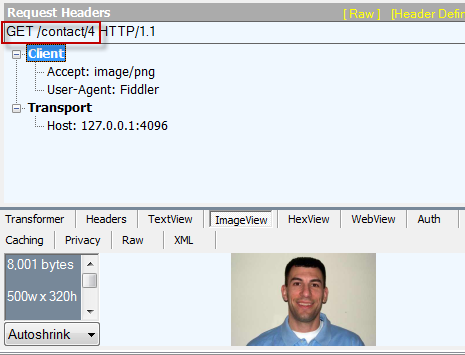 However, at PDC, they also demonstrated building a PngProcessor which would return a png image from WCF by setting the Accept header to "image/png". Yes, you heard that right – WCF returning an image! All for the same URI. The only change I've made is that, on line #24, I added a property for the Model which I typed as dynamic. That is what makes it possible for me to simply refer to @Model in the razor template I showed above. So the final step is that I need a way to pass in that model to my template. Well, with the WCF bits available from CodePlex, this is now quite easy to do. Ultimately, I need to create my own HTML Processor to hook into the pipeline. I've excluded the code of the TemplateEngine in this post in the interest of brevity. It closely matches the sample by Andrew Nurse – I just had to make a few tweaks to enable the ability to bind to dynamic types as well as to be able to read the Contact.cshtml file from disk. My complete code sample can be downloaded here (the contact manager parts are copy/paste from the sample available on the WCF CodePlex site). It is far from Production-ready (e.g., it's currently hard-coded to read only the Contact.cshtml file but could easily be extended UPDATE: I've updated code so engine now dynamically loads template based on type; for example, for a Contact object, it will find Contact.cshtml, borrowing the concept from MVC EditorTemplates) but this gives you a glimpse of the types of things that are now possible when combining the WCF HTTP library with a custom-hosted Razor view engine!